We slept like rocks. It was cold last night but we were very cozy in our tent. And best of all, there were no mosquitoes!! 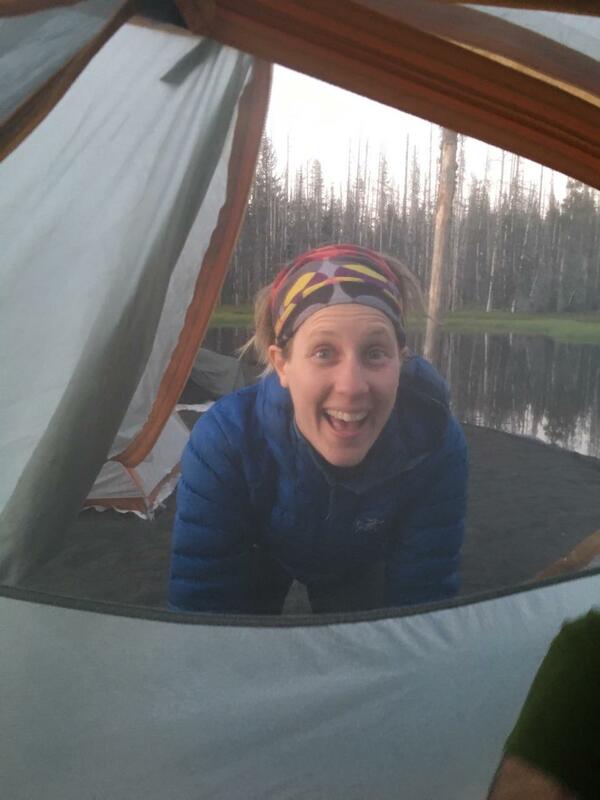 We even had the luxury of leaving the tent door open while bringing in our backpacks. Oh how the small things make a world of difference. 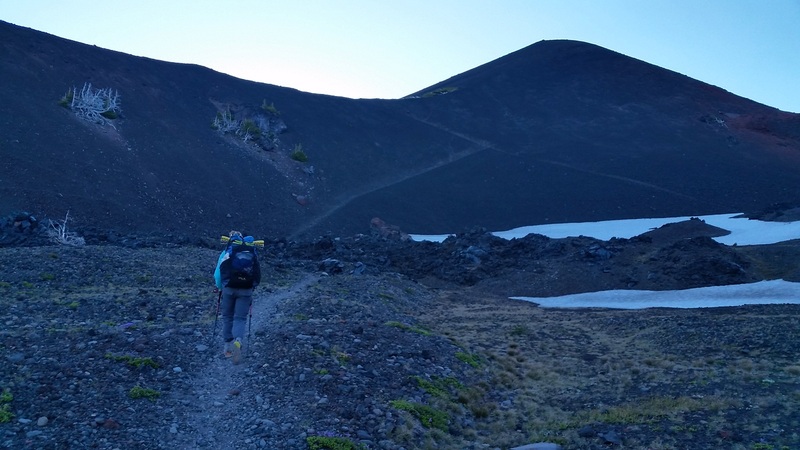 By 6:40 am we were packed and making our way up the rocky trail towards Opie Dildock Pass. The wind contributed a nice chill to the air, so much in fact that Laurie had trouble seeing the individual rocks through her tearing eyes. We felt like we were walking on Mars this morning. Black and red lava stones made up the hillside. 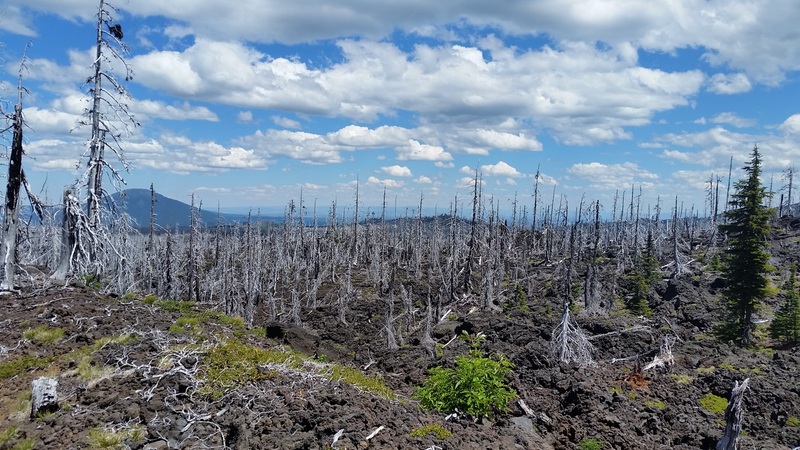 Bright white dead trees provided a stark contrast to the dark lava bed. We crossed small patches of icy snow, slowly stepping our way across. The sun crested over the horizon as we stumbled over the pass. In the distance we could see Mt Washington, Three Fingered Jack and Mt. Jefferson. Our maps are scaled to show detail on the PCT so we end up relying on other hikers for info on the distant peaks. It was another beautiful morning on the trail. We wandered through a meadow with lupine, pink paint brush and small yellow and pink flowers. The wet grass and other foliage glistened in the sun. We both wished we could hang out here forever. Technically we had enough food for one more night but we were both excited for dinner at Big Lake Youth Camp. So we carried on. 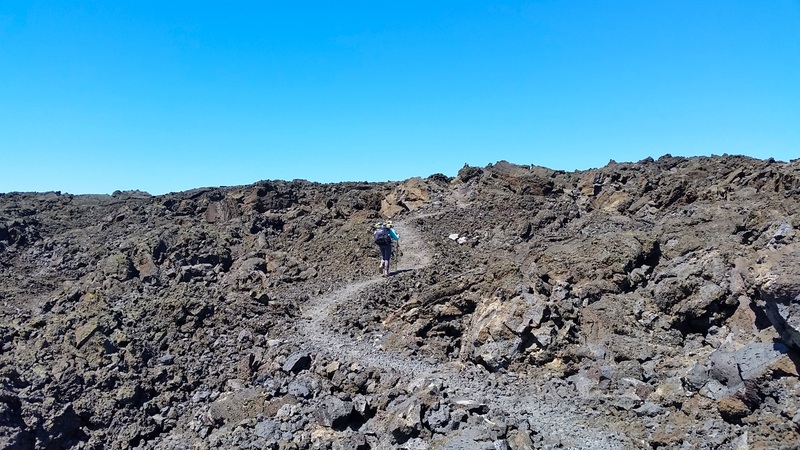 The trail took us through more lava fields. We kept stopping to admire the views both in front and behind us. The sky was dotted with puffy white clouds, but nothing threatening like the previous few days. As we got closer to highway 242, the number of day hikers steadily increased. We have seen more hikers in the last 2 days than all of Northern California and southern Oregon combined. 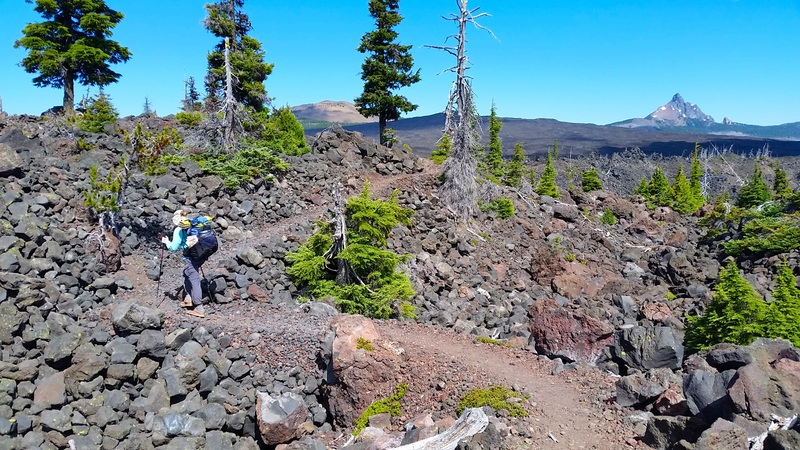 The trail switched again to a lava field and our pace greatly decreased. The small rocks rolled around under our feet, causing instability and sometimes pain with each step. We relied more on our poles but they often got stuck between rocks. It was fun initially but quickly got old. Now it felt even more like Mars, or maybe the moon. The lava was dark, there were very few trees and the only critters we saw were spiders. We walked on lava for a few miles and eventually the trail transitioned to dirt and sand. We took a short lunch break under a tree with a view of Mt. Washington. 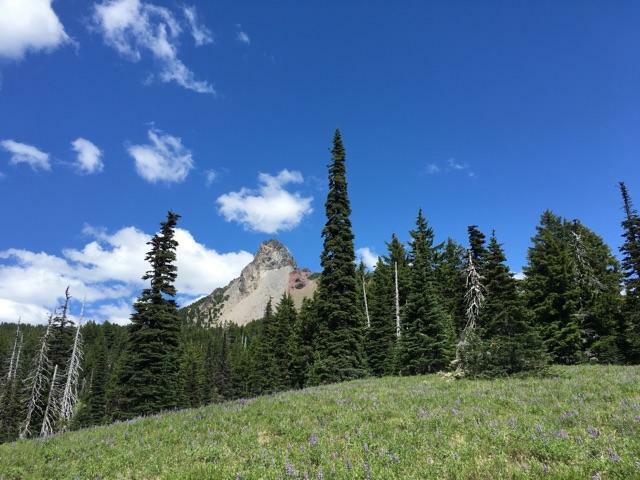 From here the trail continued through a burn area dotted with sky rocket and lupine. It was hot and Laurie turned to podcasts for entertainment. Andy seemed content with his own thoughts. We climbed up and then down 500 ft before gradually descending to Big Lake. 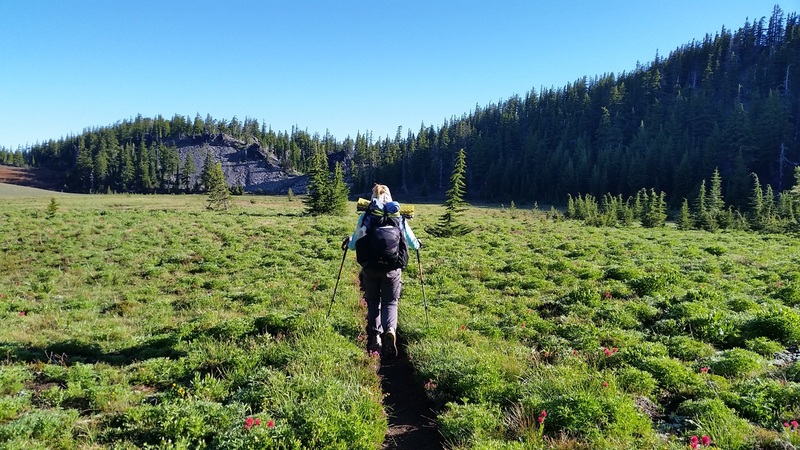 The trail cut through green meadows with tons of bear grass and lupine. We walked with smiles on our faces; we were getting closer to the camp, closer to dinner and it was beautiful! We got to Big Lake Youth Camp a little before 5 pm. As we were checking in someone threw their arms around both of us. It was Fixie! 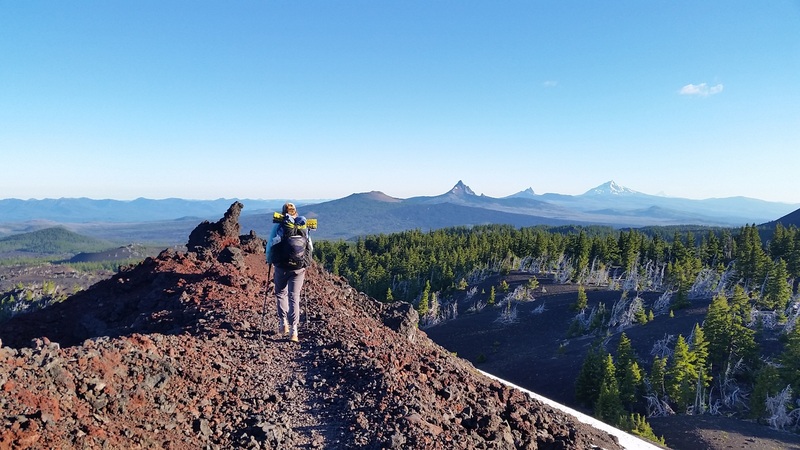 She has flipped up to Portland and was now hiking south. We caught up with her, sorted through the 6 packages and chatted with other hikers. With so many new people around it was hard to focus. Andy wanted to talk with everyone and Laurie was busy people watching and eavesdropping. Around 6 pm the dinner bells rang and we filed into a large cafeteria filed with over 300 7-10 year olds. It was a bit over stimulating but fun to be around that much energy. We filled our plates with pasta, salad and green beans and went back for seconds. They even had vegan and gluten free options! 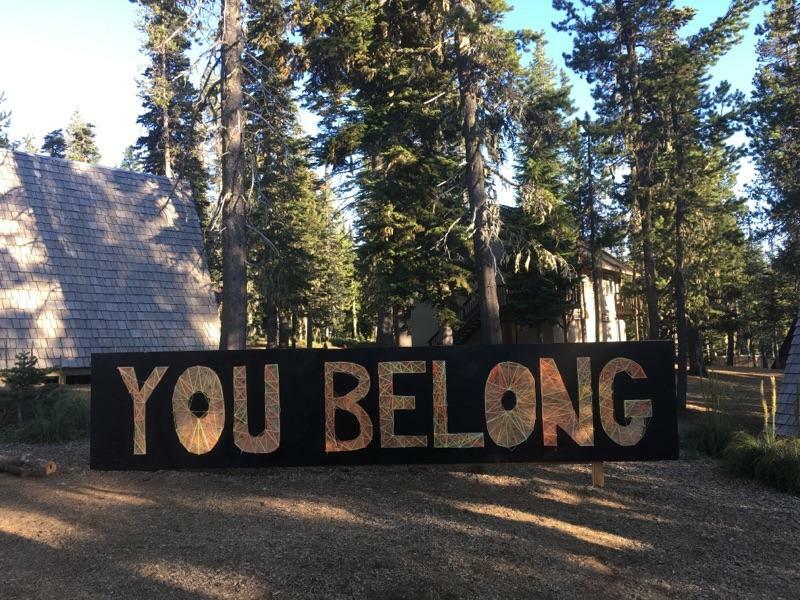 Big Lake Youth Camp is wonderful. They treat hikers very well and are a great help. 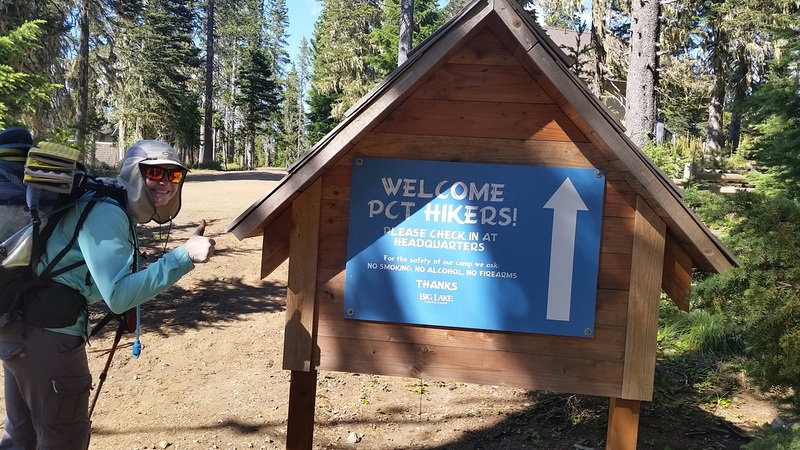 They even have a volunteer PCT hiker coordinator to help us during our time here. After dinner we showered and walked about 10 minutes down the shore to the PCT hiker camping area. 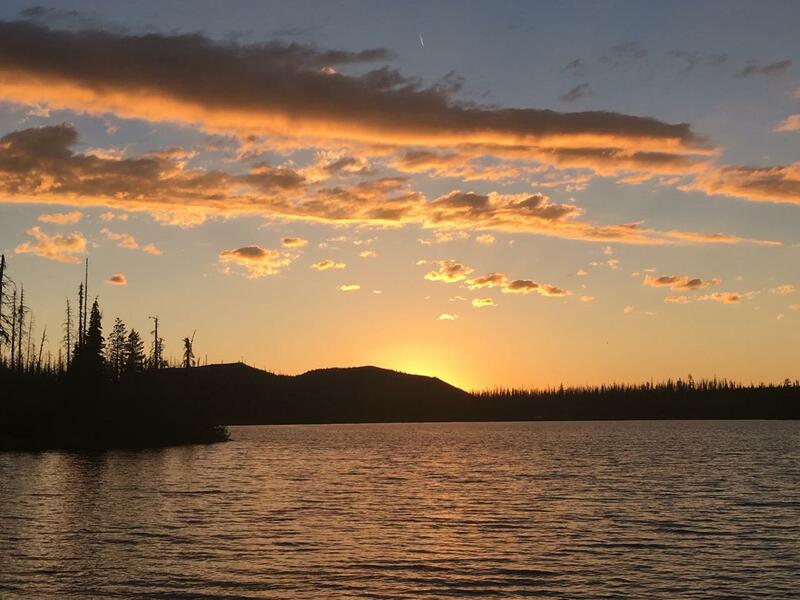 We watched the sun set over the lake as we talked with other hikers. The ducks quacked at us for a while. Andy thinks they are upset with us for taking over their beach. It has been a while since we have heard the noise of ducks, it is actually quite nice. 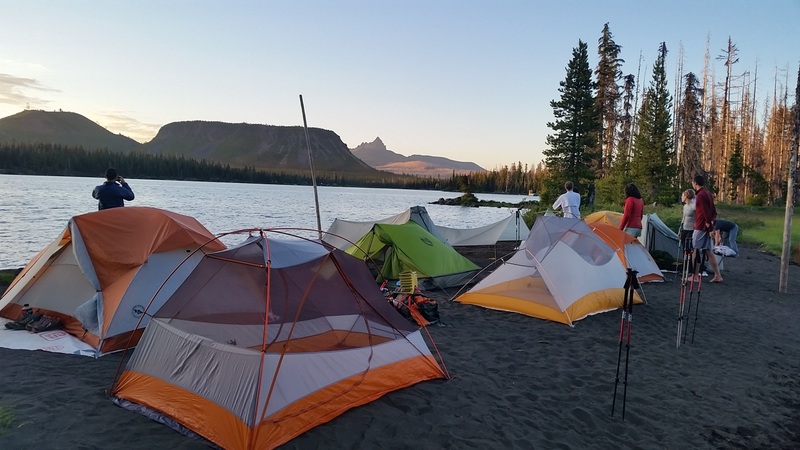 Here we are, 12 tents squished together on a small beach. As we write this we giggle at the symphony of snores that surround us. Tonight we are grateful for hiker friendly camps and ear plugs. Wow! That sunset photo would be nice enlarged and hung . Awesome photos. I spotted dribbles in this article. I remember reading your post about Pinnacles when crossing into Oregon. 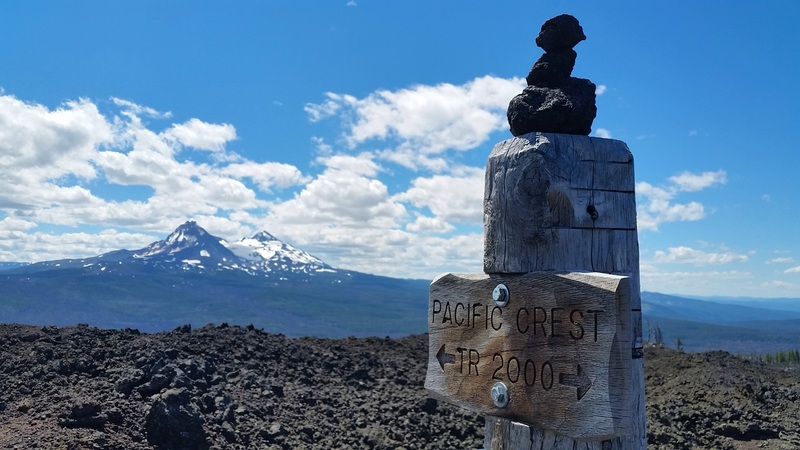 I am enjoying being an “armchair” PCT traveler, reading your posts and seeing your excellent photography. Hi Nori. Thanks for sharing the link. It’s a good one indeed.